With a history that spans centuries, lacrosse is the oldest sport native to the North American continent. 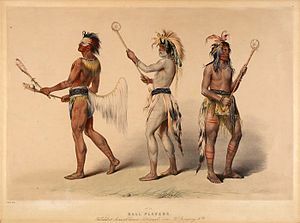 Rooted in Native American religion, lacrosse was often played to resolve conflicts, heal the sick, build strength and virility and give thanks to the Creator. To many Native Americans, lacrosse is still referred to as “The Creator’s Game.” Ironically, lacrosse also served as a preparation for war. Legends tell of as many as 1,000 players per side, from the same or different tribes, who took turns engaging in a violent contest. Contestants played on a field from one to fifteen miles in length, and games sometimes lasted for days. Some tribes used a single pole, tree or rock for a goal, while other tribes constructed two goalposts through which the ball had to pass. Balls were made out of wood, deerskin, baked clay, or stone. Men’s and women’s lacrosse were played under virtually the same rules, with no protective equipment, until the mid-1930s. At that time, men’s lacrosse began evolving dramatically, while women’s lacrosse continued to remain true to the game’s original rules. Men’s and women’s lacrosse remain two distinct forms of the same game today, but are played under different rules. Women’s rules limit stick contact, prohibit body contact and, therefore, require little protective equipment. Men’s lacrosse rules allow some degree of stick and body contact, and the game requires protective equipment.